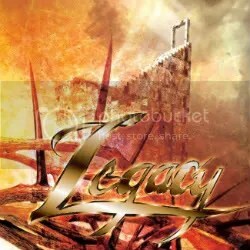 Legacy was a Christian hard rock/metal band that formed in 1987 and was based in Ohio. In 1992, the band fall apart but this Eonian release is now here as an official documentation of Legacy’s legacy (sorry, I had to say it). As is the case with many Eonian releases, I don’t think the band ever had an official album release. These songs were recorded between 1988 and 1990 and the liner notes mention the band had released singles within the Christian metal scene but there’s no mention of EPs or full-fledged albums. Either these songs were distributed by the band itself or perhaps many of these songs were recorded so that they could shop themselves around to record labels. As a result of these random recording sessions, the sound quality wavers but not by a whole lot. Their influences are pretty obvious — Stryper and Dokken (they also cite Scorpions but I don’t hear them as much). The album is okay but I really feel that the first four songs are the best. After only hearing them a few times, they stayed in my head. Other favorites are the enegetic “Soldiers Unite” and “What A World” (which is the hardest rocking song on the album). Most of the rest comes across as bland to me. These songs were produced by the band so maybe that’s the problem. If the band had a legit producer in the studio with them to point them in the right direction for these sessions they probably could have turned out higher number of quality songs. Fans of Christian hair metal will probably find this an interesting release because of their similar sound to Stryper (Dough Meachum does NOT sound like Michael Sweet though) and the fact that they don’t try to hide their faith in an effort to make themselves more accessible to the secular crowd.